A weekly compendium of music news for the discerning LGBT listener. Welcome to Queer Ear, a place where Advocate music-lovers can gather each week to discuss highlights in the music world. This week is especially rich with a show-stopping Oscars performance, impressive collaborations, new albums and more. We're all still blissed out over Lady Gaga’s breathtaking Academy Awards Performance of songs from The Sound of Music. Even Dame Julie Andrews was impressed with Gaga’s medley, which honored the film’s 50th anniversary. When Gaga finished singing, Andrews burst onto the stage to embrace her in one of the night’s most tender moments. Who's now making bets that NBC execs are eyeing Gaga for the next live musical telecast? Perhaps John Cameron Mitchell is smartly adding another name to his dream list of future Hedwig and the Angry Inch stars. Watch the full performance here. Another collaboration that's creating buzz is the pairing of the legendary Yoko Ono and Antony Hegarty. Hegarty is, of course, the brilliant transgender singer-songwriter behind British indie darlings Antony and the Johnsons. Ono and Hegarty, who have collaborated previously, re-recorded Ono’s 1985 single "I Love You, Earth,” swapping the original version's synths for ornate piano. Sales of the single benefit the Rainforest Alliance. Ono chose to release the song last week on her 82nd birthday. Listen to the new "I Love You, Earth." Fans of recently reunited rockers Sleater-Kinney are jumping for joy over the just-released video for “A New Wave," off the stunning reunion album No Cities To Love. The animated clip, which features characters from the Fox's animated series Bob’s Burgers, is the first proper new video from the band since reuniting, after nearly a decade apart. If arty punk rock with a feminist and queer-positive slant is your bag — well, you probably already own a bunch of Sleater-Kinney albums. Bonus: find Portlandia star Carrie Brownstein on guitar and vocals. Here is "A New Wave:"
This week New York dance-pop favorites MisterWives release their long-awaited debut album, Our Own House. With more than 27 million Spotify plays and an iTunes Single of the Week under its belt, the band has gotten a lot of mileage from a year-old, six-song EP. One listen to the soaring melodies of breakthrough song "Reflections," resplendent with singer Mandy Lee's brassy vocals, and it all starts to make sense. 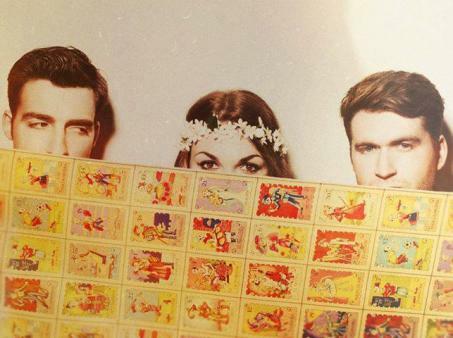 Perhaps you caught MisterWives' performance last September on ABC’s Jimmy Kimmel Live? The band’s fervid fans, including Perez Hilton, have helped the video for “Reflections” rack up nearly 3 million YouTube views. Maybe you’re feeling more aggressive? New Jersey guitar rock trio Screaming Females this week releases a sixth album, Rose Mountain. The NPR-approved band, which features tiny powerhouse singer-guitarist Marissa Paternoster, has earned critical praise for its thrashing guitars and tough vocals. Paternoster, an out lesbian, cracked Spin's "100 Greatest Guitarists of All Time" list.